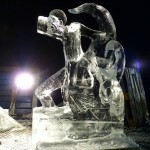 The ice sculpture season has well an truly begun with a truly spanking ice sculpture festival in Holland with ice sculpture events. 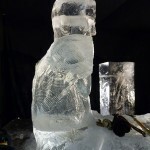 Two weeks of chainsaws, a load of chiselling and of course ice. 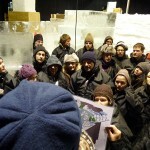 The 35 artists from all over the world did our customary walk through, with the masses of ice awaiting us, kindly stacked up by the Finnish team, what kind soles they are. 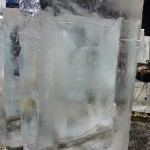 After looking at the first ice of the season, all crystal and cold, we were told what are tasks were and to get to it. 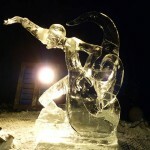 I was put with Tim Hanford who is a chap from the UK that has opted to live in the warmer climes of Italy, a great sand and ice carver. We were together to make the scene of Frankenstein. Tim was making the big man himself and me the professor with a slight reference to Michelangelo’s ‘Creation’: the professor almost touching the hand of Frankenstein as he brings him to life. It went pretty well apart from the task of putting on the monsters arms which was really tricky as they are so big and heavy. But hey, they’re on and there they are! 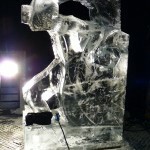 I’ve put some working photos on and will get an image of the finished piece soon.